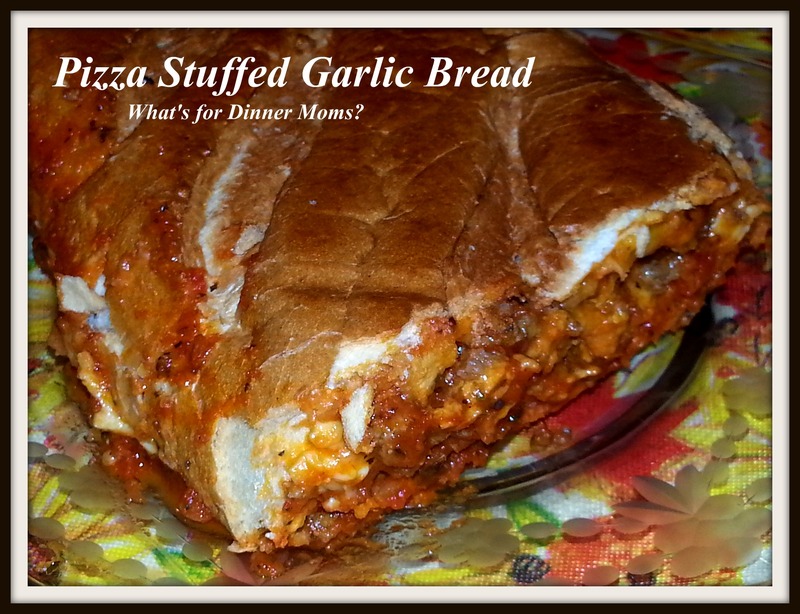 Pizza Stuffed Garlic Bread – What's for Dinner Moms? I was looking for something different to use up some bulk Italian sausage that I had leftover from making stuffing for our Thanksgiving dinner. Still trying to use up all our bits of frozen meat in the freezer! I went on Pinterest and Google and all I could find were Zuppa Toscana (which I just made about a week ago) and spaghetti or Lasagna with meat sauce. None were very inspiring. So, I decided I really wanted garlic bread and pizza but was not going to order out. 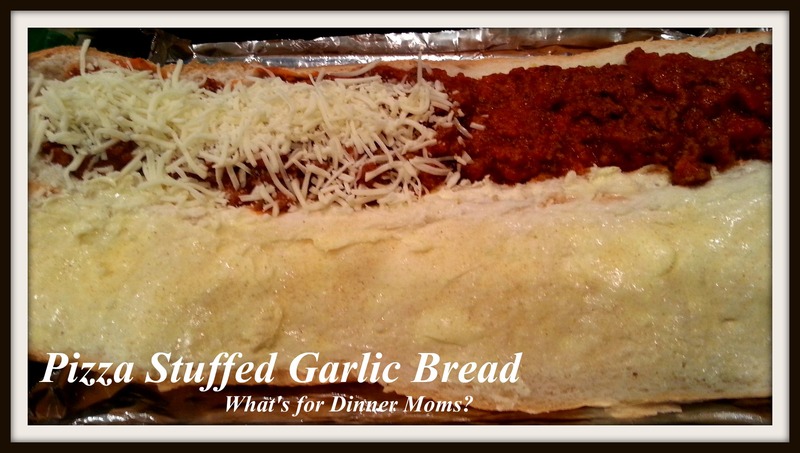 Pizza Stuffed Garlic Bread was created and it was so easy. Yumm! It was delicious and not too saucy. I was afraid that when you bit into it the sauce would run everywhere but this held together well. The secret is letting the sauce cook down and really thicken before adding it to the bread. The bread was filling and had a delicious crunch on the outside but was oozing with cheesy goodness inside. There was just a tiny slice leftover from the four of us. It was an all around hit. I served this with a side salad with Italian dressing to continue the pizza take-out theme of the evening. your favorite pizza toppings such as – pepperoni, olives, mushrooms, peppers, etc…. Preheat oven to 350 degrees. Prepare a baking sheet by covering it with aluminum foil and spraying it with non-stick spray. Cook sausage in a skillet over medium heat breaking it into small pieces with the side of the spoon as it cooks. When sausage is fully browned remove from heat and drain off fat. To the skillet with the sausage, add the spaghetti sauce, basil, oregano, and 1 tsp garlic powder. Stir and return to heat. Allow sauce to thicken until there is almost no liquid left. Taste sauce and adjust spices as necessary to suit your tastes. While sausage is cooking prepare the bread by slicing in half horizontally but not quite all the way through. You want the two pieces to still be attached. From the bottom portion remove the bread in the center to make a bowl to hold your pizza toppings. Leave a bit of bread around the edges and the bottom so that it can hold your toppings but not be too thick. When the sauce is done fill the bottom of the bread (bowl) with the sauce. Place any additional pizza toppings you want on top of the sauce and then sprinkle with mozzarella cheese. Then sprinkle 1-3 tsp of garlic powder over the butter. We love garlic so I used three but use the right amount for your family. Close loaf of bread. Slice and serve. Omg!! That looks ridiculously yummy!!! Garlic and pizza together equals heaven in my book! I agree! The best foods all rolled into one! This might be the best thing ever! What kind of witchcraft is this? Mouth watering! Yum! And a very creative use for your leftover sausage! Whoa! This looks insanely delicious!!! I can see why there was hardly any leftovers. Thank you! The best part is you can fill it with all the pizza toppings your family loves! I’m running out of creative ways to express my fondness for your recipes… they are all just so enticing! Oh my word, I should not be perusing your blog on an empty stomach! Must have in my belly now! This sounds so delicious! wow a fun and yummy dinner! I really have to make this! You are too, too sweet. Hope you like it! Thank you so very much for your kind thoughts! Thank you so very much! That is so nice! Oh my goodness, that first picture made me drool! Looks awesome but thinking trying to eat this may be messy!! A bit, but it is fun!